How To Use Orkut Friends As Facebook Friends ? How To Import OrkutFriends In Facebook ? If you have been how-to-send-testimonials-to-your-friends-in-orkut/">using Orkut and later now started to use Facebook means, here we have the perfect solution to make your how-to-send-scrap-automatically-in-orkut/">Orkut buddies friends to how-to-upload-photos-in-facebook-fast-and-safe/">Facebook buddies. •First, you have to drag this FaceBook Bookmarklet on to the how-to-download-photos-fast-in-facebook-without-any-software/">bookmarks bar of your browser. •Then this contact importer bookmarklet will appear on your Facebook homepage. •Then Login to your Orkut account and click the Bookmarklet use-your-smart-phone-to-control-your-home-appliances/">account button. 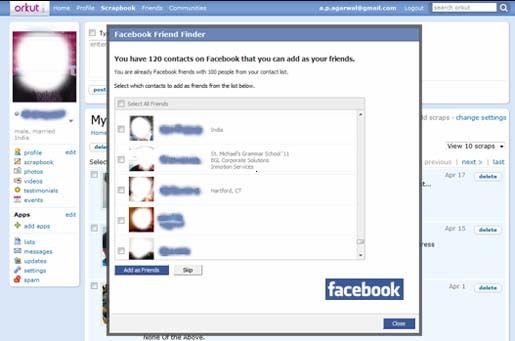 •Then Facebook Friend Finder tool will start scanning your Orkut gtalk-lets-you-find-the-friends-around-your-area/">contacts list and it will show you a subset who are also on Facebook. Then Click “Add Friends”. All it is done. •Moreover, you can use this same how-to-download-photos-fast-in-facebook-without-any-software/">friend finder bookmarklet for connecting Rediff contacts.